The newest wine to uncork a buzz among oenophiles doesn’t hail from California, France, Italy, Australia or New Zealand. It is from, of all places, India. In the land of the sun, where summers can be marked by monsoons and 107-degree heat, a Stanford University graduate and former Oracle finance manager with no winemaking or agricultural experience is doing something unheard of. In the red and black soils of a country not known for winemaking or wine drinking, he is growing grapes — not in the summer like almost every other winemaker in the world, but in the winter — to produce exceptional wines. This year for the first time, Sula Vineyards wines are available in the United States, and the Bay Area is the first place to have them. They retail for less than $10 a bottle. The wines, which are causing such a sensation in India and the United States that this year’s production is already nearly sold out, have garnered the finicky approval not only of local neighborhood Indian eateries, but also of such upscale destination restaurants as Rubicon in San Francisco and Arcadia in San Jose. For winery founder Rajeev Samant, 36, it all has been a dream, one that has unexpectedly helped set the stage for a whole new wine culture and industry in his homeland. Samant didn’t set out to do that when he quit his job 11 years ago as the only India-born finance manager at the Silicon Valley software giant. He simply wanted to go home to India to seek a new challenge. His search led him to 30 acres of family-owned land in Nashik, 2,000 feet above sea level and 120 miles northeast of Bombay. His father had been trying unsuccessfully to sell the land for years. Samant started planting mangoes there, then Thompson seedless grapes. Then it dawned on him that if he could grow table grapes, why not wine grapes? It was an audacious notion for someone who hadn’t grown up with wine. Samant says he drank only wine coolers in college, until a former girlfriend introduced him to fine Napa Valley wines, and in his teens he enjoyed sneaking sips of an Indian port that was so sweet that any real wine drinker would have been horrified. Armed with the entrepreneurial spirit of his father, who had started his own shipping company in India, Samant raised $1 million through family, friends and banks. Then, he approached wine consultant Kerry Damskey of Terroirs in Geyserville for help. Damskey, who had visited India, was skeptical. And that just isn’t done. But they learned that winters in Nashik are similar to summers in the Napa Valley. Although Indian wines typically had been made from Bangalore Purple table grapes, Samant and Damskey planted sauvignon blanc and chenin blanc — varieties that had never been grown before in India. They deliberately chose those varietals because they stand up well to the bold, spicy flavors of Indian cuisine. They planted 35 acres of vineyards that are irrigated by the nearby Gangapur lake, and built the first refrigerated, all-stainless-steel winery in the country. They coined the name, Sula, from Samant’s mother’s name, Sulabha, and were pleased that it sounded a little like surya, the word for ”sun,” which became the winery’s logo. Sula has about 50 winery employees and another 50 vineyard workers. In rural India, where employment opportunities are scarce, the winery has managed to provide a job to at least one member of nearly every family in a nearby village. All of that has turned Samant into a celebrity and one of the most eligible bachelors in his homeland. His photo and chronicles of his accomplishments have appeared in publications ranging from the Hindustan Times and the Pune Times of India to the Asian Wall Street Journal and Wine Spectator magazine. Still, success has not come without its challenges. Because of the year-round heat, the vines do not go through a normal winter dormancy. So Damskey and Samant force dormancy by pruning the vines twice a year — after harvest in May and after the monsoon season in August. The grapes grow from September through February. The first crush was held in March 1999, before the main cellar had a roof on it. Workers practically had to carry out the pomace — the leftover skins and pulp — with their hands. Even now, compared to most other wineries, much of the work is done by hand. There isn’t even a forklift. And in the vineyards, the occasional cobra still rears its head. Besides sauvignon blanc and chenin blanc, Sula also produces a blush zinfandel and a brut sparkling wine, made in the methode champenoise style with a secondary fermentation in the bottle. Samant purchased 300 acres nearby to venture into his first red wines, shiraz and cabernet, which should be available in the Bay Area next year. Last year, in only its second year of sales, Sula managed to turn a small profit. But Samant downplays that. That’s not to say wines haven’t been made in India before. But, wine experts say, until now, the quality just hasn’t been there. Amod Chopra, vice president of Vik Distributors in Berkeley, which distributes Indian beer in Northern California, remembers when he bought a whole container of Omar Khayyam sparkling wine in 1988. “‘It took 12 years for us to sell it,” he says. ”I was practically giving it away.” Even now, as the sole Northern California distributor for Sula wines, Chopra initially had a hard time persuading Asian-Indian restaurateurs and store owners to stock it. “‘I’d go to an Indian store owner or restaurant owner, someone we’ve known for 10 years, and they’d say, ‘Indian wine? I’m going to have to taste that first, man,’ ” Chopra says. 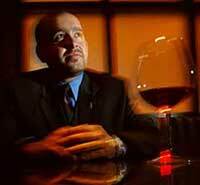 Even respected Indo-American sommelier Rajat Parr, wine director for the Mina Group, was a little dubious at first. Last year, when Parr was still the sommelier at the Fifth Floor restaurant in San Francisco, Samant came in for dinner one night and wanted Parr to try his sauvignon blanc. Later that night, Parr’s mentor, noted master sommelier Larry Stone of Rubicon, came into the restaurant. The two enjoy trying to stump one another with blind tastings, so Parr poured some of the wine for Stone, not telling him what it was. It’s now sold by the bottle at Rubicon, where Stone recommends it with tartare. Parr put the Sula chenin blanc and sauvignon blanc on the wine list at Arcadia and plans to include them at all of chef Michael Mina’s restaurants. With minerally, quince and papaya flavors, the chenin blanc is a natural with Asian flavors, Parr says. The sauvignon blanc, with its searing acid akin to a French Sancerre, pairs beautifully with sushi, shellfish and ceviche. 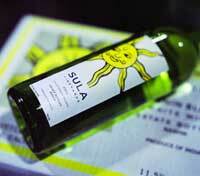 More than 40,000 cases of Sula wines have been produced this year, double last year’s output. A fraction is exported to Italy and to California. The rest is consumed in India, primarily in restaurants, where it also proved a hard sell at first. It didn’t help that Sula sells for about 30 percent more than other Indian wines, at 300 to 500 rupees or $6 to $10 a bottle. It didn’t help that wine consumption in India is minuscule, about 400,000 cases annually — less than what a mega-California winery pumps out in a year, Samant says. And it sure didn’t help that when well-to-do Indians imbibe at high-end restaurants in Delhi and Mumbai, they aren’t apt to order Indian wines, but French ones. Contrary to what some people may think, it’s not illegal in India or against the Hindu religion to consume alcohol; it’s just been discouraged by the culture for a long time, Samant says. In fact, Hindu mythology has many references to wine-like beverages. A thousand years ago, winemaking and wine-drinking were quite popular in the country, he explains. But in the latter part of the Mogul rule, which was more Islamic, those practices diminished. Under British rule, making wine from fermented fruit was discouraged even more because it didn’t easily come under the tax net. And Gandhi preached prohibition. But in the past few years, thanks in part to the success of Sula, a wine revolution has been going on. Wine consumption nationwide has jumped 30 percent in the past year, Samant says. There are about 10 wineries in India now, and nearly half of them were established in the past two years. Many are planting the same varietals as Sula. And in the same way that Indian engineers have been emigrating to Silicon Valley for training and employment, Indian winemakers are making a beeline to the University of California-Davis to study viticulture and oenology. A few are pursuing degrees, says James Wolpert, chairman of that department, while a couple of others may be auditing classes. Last year, for the first time, a conference on winemaking was held in India, attracting about 50 people. Support also is building to someday set up a public-private wine institute to establish a set of wine standards in India. Government leaders are realizing the benefits a strong wine industry can have, Samant says. Imported wines still are heavily taxed. But not domestic ones. Not long ago, a $9 bottle of Indian wine would have had a $2 tax levied on it. Now, it’s down to 50 cents. Samant is pleased at these turns of events, and to help bring high-quality wine to those who have been thirsting for it. In the land of the sun, he already has.